I got in early in the afternoon on Wednesday, and I snagged my “Judges Kit.” In it was my schedule, printed versions of the adventures I was running, an RPGA D&D shirt, and coolest of all, the upcoming Deluxe DM Screen. (See a little of it in the picture here; snag yours on or after February 15th.) I supplemented with a roll of Gaming Paper for maps, which I drew at the show. Earlier this year the Baldman—Dave Christ, who runs Baldman Games (@baldmangames) and D&D Experience, pants optional—involved me in this Dark Sun convention-only campaign. With the talented and enthusiastic Teos Abadia (@Alphastream) and Chad Brown, both of whom are also organized play vets, and the incorrigible Matt James (@matt_james_rpg), I helped create the opening chapter of a story-oriented campaign set on Athas. The campaign takes a group of Veiled Alliance members and affiliates, the player characters, from Tyr to Altaruk and beyond. In Tyr, the alliance is in trouble, and rescuing it requires characters to save their last leader in an unusual way. When she’s safe and in Altaruk, the trouble is just starting. 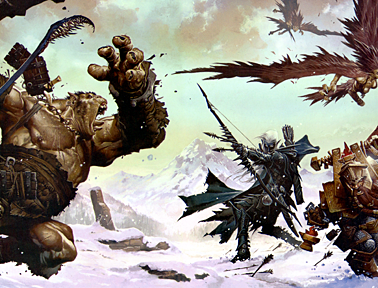 It seems the alliance’s enemies have big plans in the region and ancient magic to help them see that plot to fruition. D&D Experience saw the first chapter played out, and other chapters should appear at Origins and Gen Con, among other shows. I was slated to run the adventures for this opening chapter most days of the convention—all day in most cases—and, boy, was it a pleasure. I blame that entirely on my players, for whom I feel extremely lucky. One table had four thri-kreen characters alongside a dwarf. It’s a good thing that dwarf had personality, because thri-kreen claws in every opening attack is murder. Another table had four halflings, with Shawn Merwin’s knight among them, and one mul. The players in this “most obnoxious D&D party evar,” quoting Shawn, took Athasian halfling foodie to another level. They made “drool saves” when they put some enemies down. (That was Shawn’s idea. I blame him. Shawn’s a great roleplayer—I hope to be a player at his table sometime.) Another group was an organized bounty hunter band known as Rough Trade. I use “band” here in two ways, because these roughnecks had a musical side that benefited them in play. Their leader is a dray bard with the nickname “Darling”—don’t ask, because I don’t know and don’t want to. It was cool to see the same scenario play out differently based on character choices. In one scene, the characters needed a wooden bowl, and every playgroup solved the problem in a unique way. The choices also earned players and groups differing story awards. One group captured all the crodlus in one encounter, while other parties killed the same crodlus. But, hey, that’s what the D&D game is all about. It’s also part of why running the same adventure for different groups can be so worthwhile. Try it if you have a chance. DMing is rewarding, and it isn’t hard. But, between you and me, I’m old. Running a game for nine hours straight each day told on me a little, especially when I didn’t plan well for sustenance. Add to this that Matt James ran off with my maps one afternoon. (All was well, though, since I got to run the adventure for which I had maps for Shawn and his cohorts.) That’s the extent of my hardship at the convention, meaning I had no real hardship. I had a lot more fun. Besides, I also got extra loot, some of it prerelease, such as the new D&D Gamma World release Legion of Gold and the latest board game Wrath of Ashardalon. Both look awesome. Everything about D&D Experience is about rewarding dedicated players willing to come for half a week of D&D immersion. The seminars seem more lightly attended than, say, Gen Con. These smaller audiences are not only due to the concentrated nature of D&D Experience, but also because the gaming slots are back to back, all day, every day. Some people prefer to play and receive their news from the show’s after-hours talk. The panels are all about playing the game, asking Wizards and other experts questions, or seeing upcoming products. Speaking of upcoming products, Matt Dukes provided a blow-by-blow of the new products seminar. I already mentioned I got the newest Deluxe DM’s Screen in my DM’s kit. I’m particularly excited to see a couple products I helped with still on the schedule, namely Heroes of Shadow and The Shadowfell: Gloomwrought and Beyond. Both are about playing games set in or in touch with the Shadowfell. They also have some unique and exciting mechanics that add shadow power to your D&D game. Shadow power itself worms its way into other scenes, like an infection, tainting the use of other power sources. Few characters are pure shadow power users, like in the D&D editions of the past. I can’t wait to see the community reaction to the pure shadow user I helped create. Another great part of D&D Experience, especially since it’s more concentrated D&D than Gen Con, is being able to meet and hang out with friends, new and old. (DMing also gains you friends, let me tell you.) For instance, I met the infamous Jerry “Dread Gazebo” LeNeave (@DreadGazebo) and discovered that Erik Nowak and I went to the same art school at the same time. He sold me art supplies, too. Since Fort Wayne is a smallish city, a lot of people stayed at the same hotel and went to the same watering holes. (My favorite is J K O’Donnell’s—if you’re in Fort Wayne, try it out.) It was easy to meet up and have fun, and I was thankful for that given my wholly unreliable phone. I played a lot of after-hours games that were new to me, even if they aren’t new releases. My first ever game of Dominion—against Liz Smith (@Dammit_Liz of w00tstock and etc.) and Tracy Hurley (@SarahDarkmagic) and another guy whose name I don’t remember—saw me three points shy of the lead. (That’s right Liz. Be ready next time.) I played Three Dragon Ante: Emperor’s Gambit with new friends Jonathan Westmoreland (@EldritchReverie) and Brent DeVos. I don’t know who won, I realize, but I think it was Brent. I also played a draft round of Magic with Ice Age cards, thanks to Matt James, with Stephen Radney-MacFarland (@NeoGrognard), Rob Schwalb (@rjschwalb), Erik Nowak (@Erik_Nowak), and James Auwaerter (up and coming D&D designer). Schwalb stomped us with his red burn deck—my black creature-control deck was a little slow. Among these highlights was also Michael Robles’s (@michaelrobles) Christmas at Ground Zero adventure for Gamma World, all rhymes all the time, at J K O’Donnell’s. Matt Dukes played a doppelganger plant (?) named Optimus Gemini, Tracy Hurely ran a plastic engineered human named Barbie, and Matt James played an android cockroach whose name just drops the “roach” part of that last word. Greg Bilsland (@gregbilsland) played a cryokenetic radiation sentient cryostorage tank with a Russian accent. I forget its name, but it was looking for love. Dustin Snyder (@WolfStar76) took the part of a gelatinous winged mutant with very effective slimy powers and a warning not to fly over my character, Bam-Bam the Bang Ball, a radioactive exploding orb of fun that also served as Barbie’s pet. R-rated gameplay might be a conservative description, and we killed Rudolph and Santa. 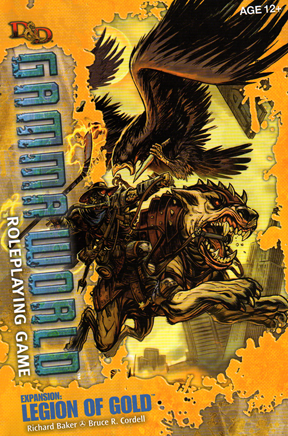 Our hijinks sold Gamma World at least twice (to Jonathan and Brent, no less). Better than that, our hysterics attracted the attention of nongamer patrons at the bar who engaged us to see what we were doing. They thought the concept was neat, especially with reference to the collider and the Big Mistake. It led to a discussion of the possibility we actually exist in an alternate reality. Nongamers are weird! Rob Bodine (one of synDCon’s overlords, @GSLLC) was kind enough to include me in a Wrath of Ashardalon game, its pieces basically fresh out of the shrinkwrap. If you’ve played Castle Ravenloft, you’ve basically played Wrath of Ashardalon, and that’s a good thing. 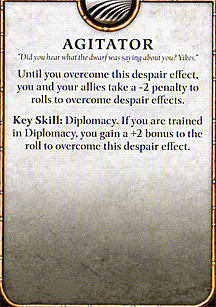 If you’ve seen the quality of Castle Ravenloft, you understand the quality of Wrath of Ashardalon. The two games are compatible and mixable, and they’re both sturdy and nice looking. Wrath of Ashardalon is also a good game to play with new friends, since you have time to chat and kid around more than a typical D&D game. Just so you know, Erik Nowak plays a mean paladin—you want him in that role. I also got to meet some new people, including Nate (surname unknown; @nullzone42). Other than that, I had good talks with the likes of Shawn Merwin, Derek Guder (Gen Con general, @frequentbeef), Chris Tulach (@christulach), and others I’ve already mentioned—especially the Ashes of Athas team. Stephen Radney-MacFarland is definitely worth a second mention, as is Rough Trade (also part of Clan Beerbiter for you LFR peeps). Despite the recovery time, these shows are always worth the time just for the people. Gamers are fine folks, and so are the people who make our favorite games. I left the convention later than anyone I know. My flight departed from the airport at around 7 PM. Or it was supposed to. Snowpocalypse XLV was descending fast on the Midwest, and Chicago air control had us grounded for a while, clenching our teeth. But the plane took off, and I made my flight from Chicago to Seattle due to a convenient bout of Alpah Flux. I fear if I had missed that plane, I’d still be in the Windy City looking for help from Snake Pliskin. Does he have skis? More important, can he see in a whiteout? Thanks for the Comicpalooza nod. The south needs more love. Will be definitely seeing you there. Thanks for the mention! I was a bad, bad girl in Gamma World and I loved every second of it. I think making the rhymes was more fun than killing creatures. I’ll leave it at that in hopes of not being more inappropriate than I was. Playing Dominion was great too. It was the first time I ever played a deck building game. I came in last but it was still great fun. It was an incredible con for all the reasons you mentioned. I loved seeing WotC sit down at so many AoA and LFR tables and it was unbelievable as a gamer to get to know so many people that help make the games I love. Readers should know (no surprise) that Chris is an incredibly valuable addition to the Ashes of Athas team. We are really fortunate to have him and he really helps make the campaign better. One of the highlights of the show for me was seeing the huge amount of role-playing during AoA slots. It was fantastic. The players really had great PC concepts and came up with great ideas on how to approach the situations within the adventures. It was really rewarding to see that. I just wanted to say your DDXP coverage was great. I just wanted to say that your review of Wrath of Ashardalon is the first one that gives me any reason to play it. My gaming friends are my D&D friends, and if we have time for a game, we play D&D. I had no reason to play a board game until your review. You said there is more downtime which gives more time for chatting and having a bit more time for kidding around is a good reason to play the D&D board game instead of our intense strategy-oriented campaign some weekends. I didn’t attend DDXP, but will be at PAXEast next month and I hope to meet some designers, developers and super fans there. I’ve heard a lot of people talking about Dominion lately… I think I may have to finally give it a try. HeeHee – that was us! And, I’ll say it again, playing at your table was so much fun. I wasn’t sure what to expect, but fifteen minutes at the beginning of the first module just getting to know the PCs and their backgrounds – with feedback and suggestions on connections – was definitely new and fresh and very cool. Chris, thanks for the Con-love! Those of us here in the southwest raise a pale candle to the Dark Sun of DDXP, although I believe 2012 may see more travel both directions. Thanks for helping us all taste of the magic of DDXP through your eyes and vivid, exciting descriptions. 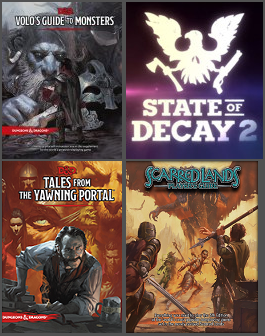 Like some of the others, you made me take a second look at a few things I might have passed over, you made me want to find an extra day a week to play Gamma World, and justify my playing of my Templar-pact sorceror in my friend’s new Dark Sun campaign, to the roleplay hilt! That is of course, until we sit down to game with you in May at Comicpalooza. And need I say it? Your work on the Shadowfell cluster of products is one of “the” most eagerly awaited products for my homebrew and RPGA home players (in 2 campaigns). More teasers, please! Thanks for the shout-out, Chris! I have to tell you that your explanation on how a lurker monster should work was simple, yet profound, and has already had an impact in my home game. Great meeting and playing games with you, and I look forward to more in the future! Hope you enjoyed it, though!